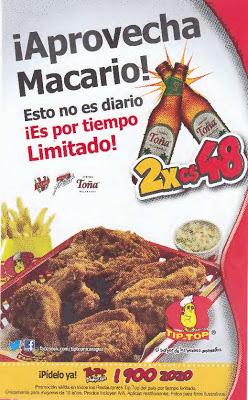 Tiptop, a fast food chicken restaurant in Nicaragua and somehow a favorite among the Nicaraguan population, has combined two Nicaraguan favorites: folkloric expressions and Toña beer. "Aprovechá Macario[...esto no es diario]" is a tongue-in-cheek expression that basically means: "Don't put off 'til tomorrow what you can do today" or "Strike while the iron is hot!" Run and get those beers boys!!! !